Why our Hospital´s Operations are so Expensive? Here we relate to potential wastes and savings in the Logistics of Medicines (Meds) and Material (Mats). Use this information like a checklist for Logistic of Mats and Meds. This is your opportunity to reduce cost and improve efficiency. If your institution is ahead of the cases presented here, that is because you already worked hard to resolve it. Congratulations! If not, maybe we can help. Calculation number displayed here are for a 200 beds hospital, that normally consumes 70,000 unit doses per month, being 30,000 solids and 40,000 liquids medicines. To adapt values to your institution, you can calculate proportionally to number of beds, for a first aproximation. 1. You waste time if your case is: you load information manually to the printing device of unit dose, instead of automatically transferring, this information, from the supplier invoice. Integration with HIS system is totally possible, with one day configuration by IT personnel. Integration could be done directly from the Hospital Information System, HIS to the unit dose printer or using our Opus 4.0 software. This operation is done about 600 times per month. Loading it manually takes 4 minutes. Calculation gives 40 hours waste time per month. It saves 40 hours per month, for a 200 beds hospital. 2. You waste time if your case is: you cut manually blister to convert in units. A 200 beds hospital needs to cut about 30.000 doses per month. Rate of manual cutting is 400 cuts per hour. Cutting time is 75 hours per month. With automatic cutting machine (BC 100) is made at an average of 2,000 cuts per hour. As this cutting is done simultaneously with other operations, then all cutting time is practically saved. Manual cutting is a repetitive effort that causes a professional lesion with possible legal claims. De-blistering or taking the medicine out of the primary package is not considered here, because of lack of micro-biological safety, cross-over contamination and the loss of validity time, which involves more costs. It saves 75 hours per month. 3. You waste time, if your case is: you are doing the unit-dose re-packaging manually instead with machine. Manual unit dose re-packaging is made at a rate of 200 units per hour: taking out off the box, searching information, printing the label, inserting the unit-dose at the pre-made package, labeling and closing or sealing. It requires about 3 people to manually prepare 70,000 unit doses at a 200 beds hospital. 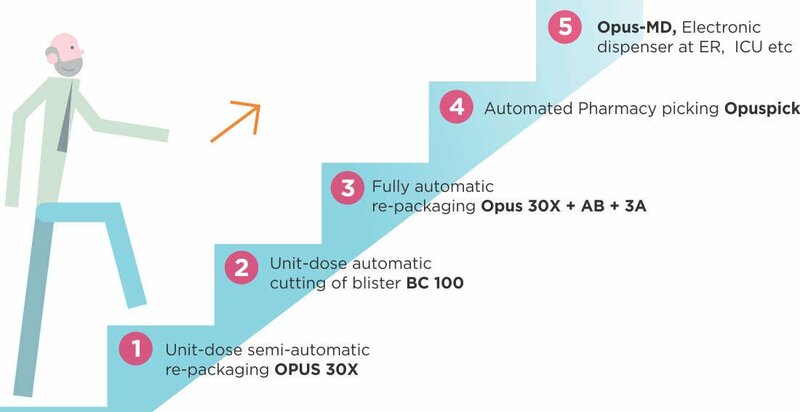 With semiautomatic equipment only 1 person is needed at the unit-dose packaging process saving 2 collaborators at the Pharmacy. With Opuspac’s fully automatic equipment you save 2,5 operator, depending on the size of the batches. This solution is specially recommended for hospitals from 300 to 1,800 beds. It saves 320 hours per month, with semi-automatic equipment. 4. You waste time if your case is: you are doing manual picking when dispensing Mats and Meds from the Pharmacy, instead of automatized, non robotic process. The savings calculation at this process depends on the number of deliveries per day, that the central Pharmacy makes to the wards. In some cases, they are one each 2 hours and others are one per day. We are going to make de calculation based on 4 times per day, that is also our recommendation. Manual picking rate varies from one institution to other, but for 200 beds, 85 % occupancy, 4 deliveries per day and 4 doses for patient-time to be prepared at each delivery, in two hours, gives 340 doses per hour to be prepared or 10.6 seconds per dose. That is 43 seconds per prescription delivered. It will take 3 or 4 people to make it manually. Converting all information of flow of Prescriptions into digital data, with Opuspick, allows to see when you need less or more persons at picking, making a better strategy for this operation. With Opuspick automatized picking would take only two persons, per shift, saving no less than one person per shift. It saves: 450 hours in total 3 shifts, per month. 5. You waste time if your case is: you are sending boxes to wards, instead of preparing the prescription for one period of time and patient directly from the central Pharmacy. The process made by the nurse, at the ward: 1) searching for a box at the drawer, 2) taking out of the box, 3) cutting de blister, 4) checking the bar code, 5) placing at the container to take to the patient, 6) looking at the following drug to that patient, 7) labeling the container to take the drug to the patient, is a waste of the nurse time, who is normally more qualified and costly personnel. Saving only one minute at these operations is important. This process is being made 70.000 times per month. Only 1 minute per dose is 70.000 minutes per month. That is a saving of 1,166 hours per month. It saves 1,160 hours per month. 6. You waste time if your case is: your nurses need to pick a drug personally at the central Pharmacy, at 1% of the Administrations. Time walking to central Pharmacy is no less than 15 minutes, of service interruption. With 4 administrations per day, are 20,400 administrations per month. If only 1% of administrations requires to pick up at the Pharmacy are 204 trips or 51 hs. Centralized logistics (Pres-pack) with the aid of des-centralized Automatic Dispensers almost eliminates the need of nurse walking to Pharmacy. Air tube distribution for mats and meds are also very good for this. It saves 51 hours per month. 7. You waste time if you have: many calls to Pharmacy for lack of information. Additional information at unit-dose package and Pres-pack makes that Opuspac System helps the nurses at the very moment of drug administration. Avoiding some of these calls, delivering information with anticipation can reduce wasted time. Estimated 1% of Meds administration needs a call that delays 3 minutes. It saves: 35 hours per month. 8. You increase losses if your case is: you stock boxes of drugs at the stock department instead of unit-doses. Stock deviations are a reality at almost everywhere. Some drugs are high price. Our procedure would not guarantee zero deviation, but it is one more barrier. We make the unit dose re-packaging process immediately after receiving the drugs. The same day, only a few hours later, boxes are discarded at the garbage and drugs are kept at the storage room in the unit dose package. This kind of package cannot be sold at a parallel market. Stock deviation average is 3% at many countries. Reducing only 1% is a good opportunity. It saves: about 2,000 dollars per month. 9. You increase waste stock if your case is: you send boxes to wards instead of centralized logistics of drugs prepared for each prescription – patient and some period of the day (Pres-pack). Sending boxes of drugs to be administrated for nurses at any department, means you spread a huge stock of Meds, elsewhere without a centralized and proper control. This is not good managing. Each de-centralized pharmacy is a potential problem without an electronic dispenser or centralized distribution (Pres-pack). It is estimated 5% loss. It saves: 10,000 dollars per month. 10. You increase waste if your case is: you have open drawers at the dispensing area of Central Pharmacy. Drawers that open electronically, only when the requested drug or material is at the Prescription order, eliminates many opportunities of take off the stock without proper authorization. We estimate only 0,3 % of loss can be avoided with this procedure. Opuspick equipment has all drawer closed and only opens when authorization is at the system. It saves: 600 dollars per month. 11. You increase your waste if your case is: you are taking off the blister or primary package, instead of keeping and preserving it. At most countries, the law says that taking off the drug of the primary package reduces 75 % of the remaining validity time. When this time pass the drug should be discarded, what creates another waste of drugs. 12. You increase your losses if your case is: you are not charging directly, everything you use, to customer account, instead of reading a barcode and loading that expense for material or drugs to patient. Charging to general account to the distribute to all patients like a general expense, is not good administration procedure. 13. You waste capital investing if your case is: you buy or use more automation technology that is needed, instead of adapting with precision the technology to your exact needs. Best situation is to have a technology scalable, that you can increase or improve your automation equipments as your needs grow. Very appreciated prescription robotic preparation system is one example of technologies difficult to repay. It reduces to zero the errs of dispensation which values are normally low, between 1 and 2% of Medication AE, but it does not reduce Administration AE that are normally around 40%. They also do not collect Mats at the same time with Meds, what makes the process less efficient. With scalable strategy you are ahead of investing more than is needed. 14. You increase your waste of time and money if your case is: you do not have barcode at the process, instead of having everything controlled electronically when pass from one step, to the following. It is a general rule of thumb, that can be applied to many process at the healthcare operation: use of barcode generally reduces from 10 to 1 the incidence of errs. Reduction is about 90% and when you applied that reduction to many points of the process, the incidence on process quality is outstanding. Nothing can be more important than use of barcodes at the different points of the logistics. It should be made at the exact point of use of the medicine. Results are better when you control, your administration, with barcode again at the bed side before Administration. If Adverse Events are 10% of attentions, without barcode it will raise up to 30%. That is additional 20%. At a 200 bed hospital, 85 % occupancy, 20% additional adverse events for not having bar code, 50% of them are avoidable, 30% of them at Medication process and 40% of them at Administration with 50% moderate, this will affect 61patients per month, considering 3 additional days of the patient at the hospital at 800 u$s per day is 73,200 u$s. It saves: 73,200 dollars having bar code per month. 15. You increase your loses if your case is: you don’t make re-packaging of vials and ampoules. · If the nurse has a device to read the barcode at the side of patient bed, you can check if the drug is the correct one. If you do not have this and you only control at the wards, your risk is higher. · At the best situation, you know that you are with correct drug, but you do not have information about the route and speed of administration. This is the last step of the Medication Administration, and there is not another barrier. You should be redundant with the information. If you have this information at the hand held, you risk is with enter-enter reflex. Opuspac System induces the lecture of the text at the unit dose and carries you to the conscious mode. · You also have alerts and advices with designs to call the attention and text to be very precise in the message. · You have the capital and small letters at the drug name to avoid an adverse event at LASA drugs. · You have an OPC, Opuspac code including an universal code, given by FDA, able to be read by thousands of applications at any country. · You have the possibility to use the Pres-Pack where the dilution calculation is already made. Waste for this concept, we will include at the following point. 16. You increase your waste if: your personnel lacks of Information at the proper time. Giving the right drug, to the right patient, at the right time, with the right dose and the right route is the commitment we ask to every nurse. But at the final moment, he or she is alone in front of the patient bed with all the doubts of a complicated science and little help from others. Being redundant with the information and delivering the most complete information possible is our duty and our convenience to save money. The average value at USA, for an AE is 4,200 u$s. That gives 126,000 dollars per month for total cost. That is the total waste. Information is vital and we estimate we can reduce more than 20% of that value. It saves: 25,200 dollars per month. 17. You waste time and money if your case is: you don’t have a system to make fast and precise calculations of dilutions. Taking a simple case, manual dilution calculus would take 4 minutes. Some studies tell us of 8 minutes. Using Opuspac System calculation spreadsheet will take less than 1 minute. Using the information at the Pres-Pack (see it at page 15 of the Patient safety brochure) it will take zero, because dilution it is already written. Rate of mistakes with manual calculations goes up to 40% . We assume that are 40.000 liquid doses per month and 50% of it needs calculation of dilution. That is 20.000 calculations per month. Assuming 2 minutes saved with Opuspac spreadsheet calculation gives 40.000 minutes or 666 hours per month of saving. It saves 666 hours per month with Opuspac spreadsheet and double of it, with Pres-pack. 18. You waste time and money at AE if you: do not make unit dose re-packaging and creates necessary differentiation for drugs LASA and others. Many adverse events happen for lack of differentiation. Colors also help to create that differentiation about drugs that are: LASA, psycho-tropic, controlled drug, photo-sensitive, thermos-sensitive, etc. Waste for this concept is included at point 16. 19. You waste money if you do not take all precaution to avoid: patient falling. Patient falling is one of the big issues at patient safety. Are 3.3 to 11.5 falls each 1000 patient-days at USA. Estimated average cost estimated in USA is 14.200 dollars per falling. Many drugs take to dizziness and similar states. Alerts of risk of falling are included at the unit dose package. Combination of several drugs with risk, can be also noticed through Prespack. We cannot tell how many falls can be avoided with our alerts, but redundancy is highly recommended. Our ZAP labels ready to transfer to different places (see pag 17, brochure of Patient Safety) is one of the solutions. Patient falling for a 200 beds hospital is between 17 and 20 per month. If only 50% are serious and moderated we have about 9 falls, that would cost 127,800 dollars per month.